SOFIA—Nyari Tritul Rinpoche, a senior lama of the Gelug school of Tibetan Buddhism, visited two cities in Bulgaria last week—Vratsa and the capital Sofia—to give Dharma teachings. During his visit to Sofia from 20–23 November, Nyari Tritul Rinpoche’s teachings included an explanation of the Mandala offering that aids us in overcoming attachment, and teachings on the Seven-limb Prayer, which emphasize the attitude we must develop toward our spiritual teachers. He also bestowed an Empowerment of the Twenty-one Taras, according to the tradition of the great Indian scholar Atisha (982–1054). Nyari Tritul Rinpoche also presented his first book, now translated into Bulgarian, called The Path to Happiness, with his commentary on “The Three Principal Aspects of the Path” (Tib. Lam Tso Nam Sum)—a fundamental Mahayana text written by the founder of the Gelug school, Je Tsongkhapa (1357–1419). Nyari Tritul Rinpoch, born in Mundgod, southern India, in 1977, was recognized as the third reincarnation of the 89th Ganden Tripa, Lobsang Nyandrag Gyatsho, at the age of 3. The Ganden Tripa is the holder of the throne of Ganden Monastery and the head of the Gelug School of Tibetan Buddhism. In 1981, Nyari Tritul Rinpoche joined Ganden Shartse Monastery in Mundgod under the tutorship of Venerable Nyari Gen Lobsang Tempa, the former abbot of Gyuto Tantric Monastery. He was officially enthroned at Ganden Monastery in 1992. During his visit to Vratsa, where Nyari Tritul Rinpoche taught from 24–26 November, one of the many items in the program was an explanation of Lamrim (“Stages of the Path”)— a set of teachings based on the 11th century text A Lamp for the Path of Awakening written by Atisha, which has been adopted by all schools of Tibetan Buddhism. The Lamrim tradition categorizes beings according to three levels of spiritual capacity: lesser, middling, and greater. In Vratsa, Nyari Tritul Rinpoche also bestowed the Empowerment of Amitabha (Tib. Öpame)—the Buddha of Boundless Light, who vowed to lead all sentient beings to his pure realm Sukhavati (Tib. Dewachen). After completing his education in India, Nyari Tritul Rinpoche set out to travel around the world teaching the Dharma at the Buddhist Tibetan Studies centers of Ganden Choeling (“Joyful Garden of Dharma”). This network of Dharma centers was founded in 1994 by Venerable Kyabje Khensur Rinpoche Tamding Gyatso, who was the abbot of Ganden Shartse Monastery. In 1987, Kyabje Tamding Gyatso was sent to Spain by His Holiness the Dalai Lama and established centers in several cities. After his passing into parinirvana, Venerable Geshe Tenzing Tamding took over the role of spiritual guide for the centers in Spain from Kyabje Tamding Gyatso and opened more branches in Asia, North and South America, and Europe, including in Bulgaria. Geshe Tenzing Tamding visited Bulgaria in 2010 to establish Dharma communities in Sofia and Vratsa, as well as Ganden Choeling Centers and Chu Sup Tsang Foundation. As his assistant, Nyari Tritul Rinpoche, started a teaching program in Bulgaria after this visit. His last teachings in the country were welcomed with great interest and were attended by old and new disciples of the tradition. ​Tara (Tib. Drolma) is a female Bodhisattva, known as “the mother of the Buddhas.” Her 21 emanations have their own mantra and enlightened qualities, which include protection, pacification, purification, rescue, and healing. 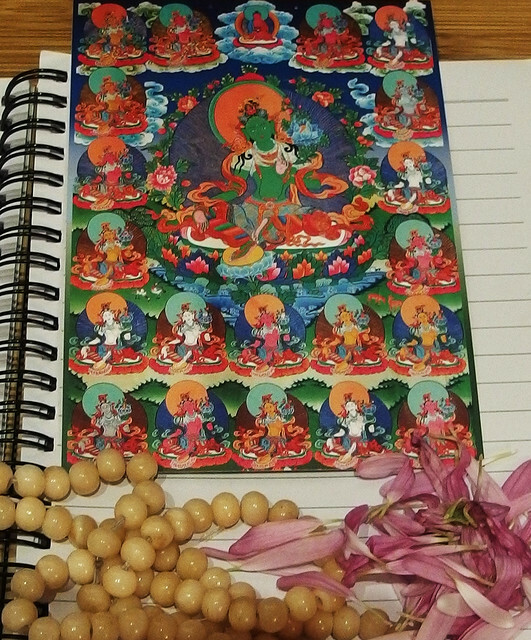 Atisha’s tradition of the 21 Taras is one of five systems of her emanations in Tibetan Buddhism. The Atisha system depicts all of the Taras in a sitting posture, with the same face and with two arms. The Taras are differentiated by color.